Earlier this month, I wrote about NFL Hall of Famer and former Michigan Wolverine captain Benny Friedman and his struggle for recognition as one of football's early pioneers and as the game's first true innovator of the forward pass. 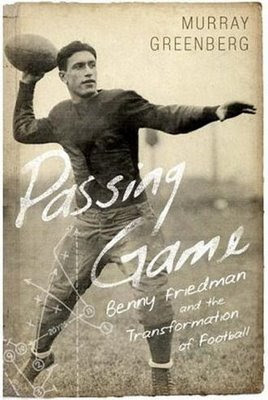 I mentioned that in December, "Public Affairs Books released Passing Game: Benny Friedman and the Transformation of Football by Murray Greenberg. Still, questions about the reason for Friedman's historical obscurity remain unanswered." I was fortunate to be able to catch up with Greenberg to help elaborate on some of these unanswered questions. HuggingHaroldReynolds: You cite the 1998 Brandeis tribute to Benny Friedman as sparking your interest in writing this book. Prior to that, how familiar with the quarterback were you? Was it as a football/sports fan that you felt it was time this story was told or did you feel that culturally it was long-overdue? Murray Greenberg: As an intercollegiate athlete at Brandeis years after Friedman had left there, I had heard of him, but really knew no details of his life and career until that 1998 tribute. Friedman was a genuine American innovator and American Jewish hero, a major celebrity who had fallen through the cracks over time, so his story was long overdue on several levels. HHR: The book makes a very strong case regarding Benny's role in pioneering the modern game - not just his influence in establishing the pass as a common element of the offense, but to the point where defenses were forced to account for it and as a result new defensive formations were created, namely the advent of the modern linebacker position. MG: When the great Sammy Baugh passed away last month, many in the media widely hailed him as the man who transformed football as the game's first great passer. With all due respect to the immortal Baugh, the man who transformed football as the game's first great passer was Benny Friedman. In 1929 Friedman, playing for the New York Giants and throwing the roundish "melon" ball then in use, passed for an unheard-of 20 touchdowns (breaking his own record). Hall of Famer Ernie Nevers was second that year with six TD passes. Friedman's record lasted thirteen years, finally falling to Cecil Isbell in 1942. Benny's pioneering passing inspired the league to slim down the ball and eliminate rules that discouraged passing, paving the way for such passers as Isbell, Arnie Herber, Sid Luckman, and Baugh (who still didn't pass for as many as 20 touchdowns in a season until his seventh year in the league). "Friedman revolutionized football," George Halas said. And yet he is overlooked, as illustrated in the wake of Baugh's death. There may not be any one reason for this. Though I did not encounter hard evidence that would establish anti-Semitism as an explanation for Friedman having been overlooked, anti-Semitism can be subtle. Given that, and given Friedman's extraordinary accomplishments in and singular contributions to the game of football, it is not unreasonable to consider anti-Semitism as a possible factor. His perceived cockiness when it came to his football skills, his lobbying for induction into the Pro Football Hall of Fame, his bitterness at the Players Union for denying pension benefits to pre-1958 players, and the mere passage of time since his playing days are also possible factors. And sometimes, for no apparent reason, people who have made significant contributions in their field, even those who attain celebrity at some point, become lost over time. HHR: Benny can be in many ways pointed at as the first Jewish sports hero. Yet, his popularity transcended just the Jewish community. His religion is an underlying theme throughout the book, especially given the rise in anti-Semitic attitudes during his height of popularity. Yet, it was a large part of his marketability, and didn't seem to directly negatively impact him in many ways (though it can be argued there was a good amount of latent bias). How much was being Jewish help Benny compared to hinder him? MG: Rising anti-Semitism in America in Friedman's time was a factor to be dealt with by every Jewish athlete of the day, and Friedman was the most famous and best Jewish footballer of all. Mistreatment from Friedman's first Michigan coach -- mistreatment that Benny attributed to anti-Semitism -- nearly suffocated Friedman's playing career before it got started. On the other hand, Friedman was a hero to the American Jewish community, a fact that played a part in the two college head coaching jobs Friedman would get -- both at schools with heavy Jewish influence. But Benny's Jewishness was also a fact that may have played a part in the several major college coaching jobs he sought but didn't get. HHR: Football at the time was rather one dimensional, as were the mindsets of the coaches and players regarding how the game "should be played." How much a factor would you attribute the novelty of the forward pass upon unsuspecting defenses/teams compared with Benny's talent as a reason for his success? Was the style of play as much a "secret weapon" as much as Benny was? Was it the fact that Yost was forward-thinking enough to utilize the athlete's talents? MG: Before Friedman, defenses generally were not prepared to defend the pass, but that is because no passer as talented as Friedman had ever appeared. As no less an authority than Red Grange said, "Benny Friedman was responsible for changing the entire concept of defense." Yost certainly was aware of the talent his quarterback had and was smart enough not to let football's anti-passing traditions stop him from letting Friedman use that talent. Friedman's unique passing ability may have been a secret at first, but teams quickly realized what they could expect and began drawing up defenses just to stop him -- usually without success. HHR: How big an influence was the outcome of the Notre Dame/NY Giants game on the perception of pro football? MG: While the 1920s saw college football experience perhaps its most glorious era, that decade saw the National Football League in a struggle for survival. Professional players were widely viewed as rough, relatively unskilled mercenaries lacking in spirit and discipline. Neither the fans nor the media were willing to divert their passion for the glamorous college game to the hardscrabble pro league. Even the NFL's flagship franchises -- the Packers, the Bears, the Giants -- struggled mightily at the gate. The Notre Dame/Giants game in 1930, which I detail in the book and in which Friedman played a major role, provided a critical boost for the NFL's credibility. HHR: In many ways, Benny resembles an early Joe Namath. Both were given "astronomical" contracts for the not only their transformational styles of play, but for the fanfare and gate receipts that accompanied it, their self confidence, their similar collegiate paths and leadership reputations while playing for legendary coaches, and, of course, their use of the forward pass and the way they/it ushered in two very transformational eras of the pro game - Benny's to the modernization, Namath's to the AFL-NFL merger/Super Bowl/television era. Is there a better modern player with whom to compare Benny? MG: As you point out, there are some interesting parallels between Namath and Friedman (though Benny, a big believer that players could play tough while protecting themselves from injury,believed that Namath did not properly protect himself). Peyton Manning and Tom Brady at first blush might not appear too similar to Friedman given the disparity in size between them and Benny, but when it comes to the qualities that make for a great quarterback -- outstanding passing ability, field generalship, leadership, and physical toughness -- there is a good deal of similarity. HHR: The decision to cut the football program at Brandeis was described as hastened by both a sense of jealousy over Benny's popularity and subsequent fund raising ability, as well as the disdain by academics at the university who sought to disassociate itself with the "brutish" sport with the school's blooming scholastic reputation. That said, what is the current perception at Brandeis of Benny's contributions and reputation as a part of its establishment and success? MG: I believe there is some awareness and appreciation within the athletic department and within the university administration at Brandeis of Friedman's indispensable contributions to Brandeis athletics and to the university generally. I hope my book will help to broaden and deepen that awareness and appreciation. HHR: Given his contributions to Michigan in the 1920's, and the fact that college football was drawing tens of thousands of spectators weekly in college stadiums across the country, pro football aside, how hasn't his college success and recognition alone propelled Benny's legacy? MG: I would reiterate my response to question 2. HHR: While a handful of early stars are synonymous with the sport - Grange, Nagurski, Rockne, and most recently with his death, Sammy Baugh's multifaceted on-field exploits are remembered again heralded, in general, do you feel the post-1960's modernization and commercialization of pro football has come about at the expense of the history of the sport? MG: I think there is a tendency for the history of a sport to become somewhat forgotten as time marches on and the sport evolves and takes hold of its current generations. Modern-day sports are an important part of America's social fabric. The way the games are played today and the players of today should be appreciated and celebrated. But it is important also to celebrate and appreciate the pioneers who laid the foundation for the sporting spectacles we now enjoy-- pioneers such as Bobby Orr, whose rink-long rushes popularized hockey's "offensive defensmen"; Babe Ruth, whose astonishing home runs revolutionized baseball; and Benny Friedman, football's first great passer, whose unique ability to pass the football launched the game toward its passing-dominated modern era and its status as an American sporting obsession. Thanks for you post. I must say that you have done a very nice and informative post. keep sharing such type of write ups.